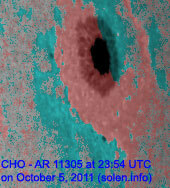 Last major update issued on October 6, 2011 at 05:00 UTC. 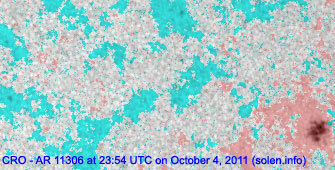 The geomagnetic field was quiet to minor storm on October 5. 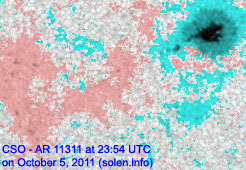 Solar wind speed ranged between 344 and 469 km/s. 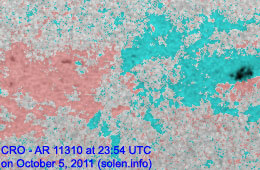 The CME observed on October 1 arrived at SOHO at 06:55 UTC causing unsettled conditions for the remainder of the day with the exception of 14-19h UTC when minor storm conditions were reported. 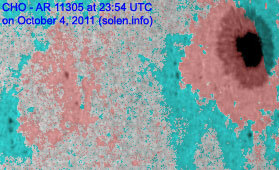 Solar flux measured at 23h UTC on 2.8 GHz was 126.7 (increasing 16.6 over the last solar rotation). The planetary A index was 20 (STAR Ap - based on the mean of three hour interval ap indices: 20.0). 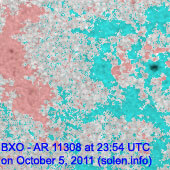 Three hour interval K indices: 22235533 (planetary), 13334533 (Boulder). 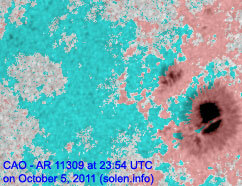 Region 11305 [N11W66] was quiet and stable. 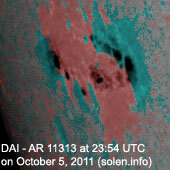 Region 11306 [N14W46] was quiet and stable. Region 11307 [N15W18] decayed slowly and quietly. 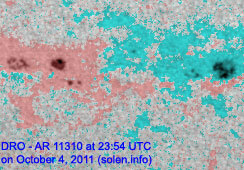 Region 11308 [S26E07] reemerged with small spots. 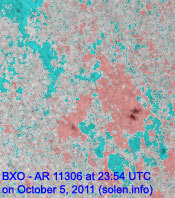 Region 11309 [N23E29] was quiet and stable. Region 11310 [S33W10] decayed slowly and quietly. Region 11311 [S12E06] decayed in the trailing spot section. 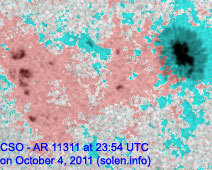 Region 11312 [N23E62] was quiet and stable. 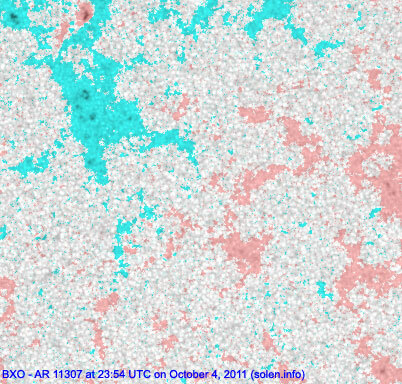 New region 11313 [S14E69] developed quickly early in the day while little change was observed during the latter half of the day. 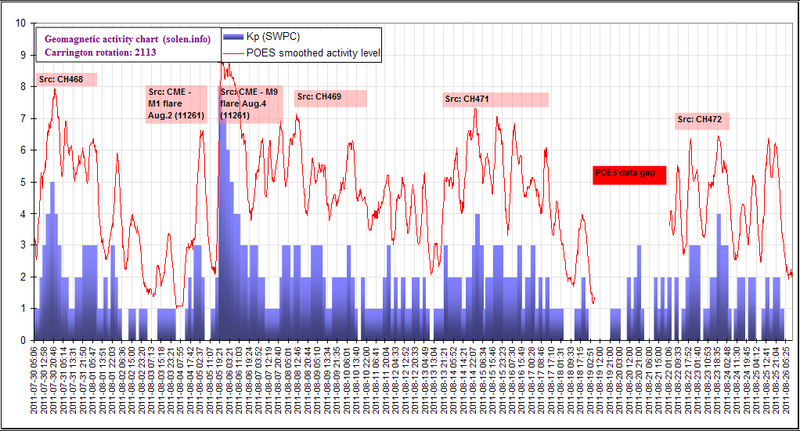 Flares: C1.1 at 03:53, C2.3 at 07:43, C6.1 long duration event peaking at 11:22, C9.2 at 12:42 UTC. 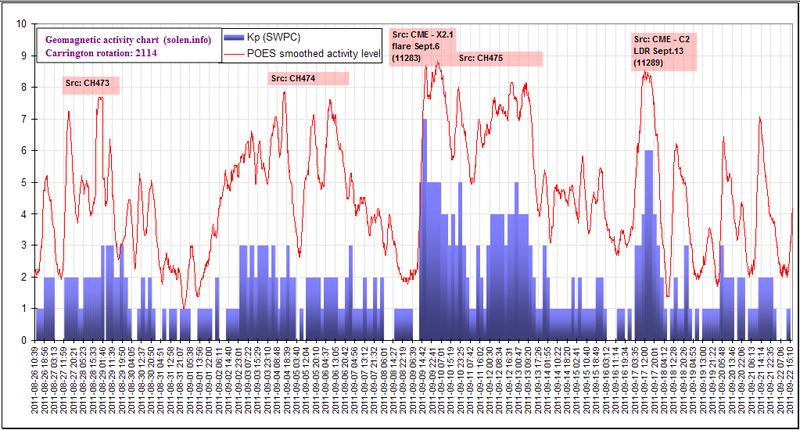 October 3 and 5: No obviously Earth directed CMEs observed. 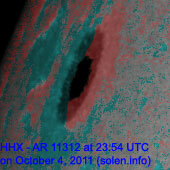 October 4: No obviously Earth directed CMEs observed. An impressive full halo CME was observed in LASCO images following an eruption in a very active backsided northern hemisphere region. 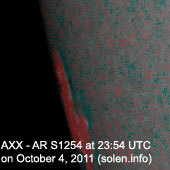 This region will rotate into view in 2-3 days. 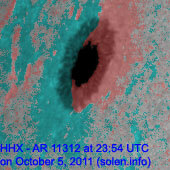 Several filament eruptions were observed during the latter half of the day in the southern hemisphere. 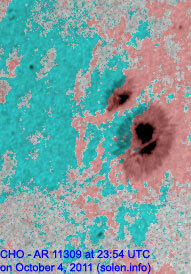 It's uncertain if any of these eruptions produced small partially Earth directed CMEs. 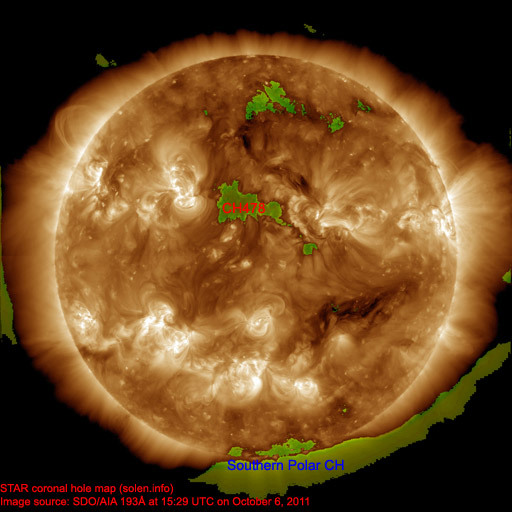 A northern hemisphere coronal hole (CH478) was in an Earth facing position on October 5-6. 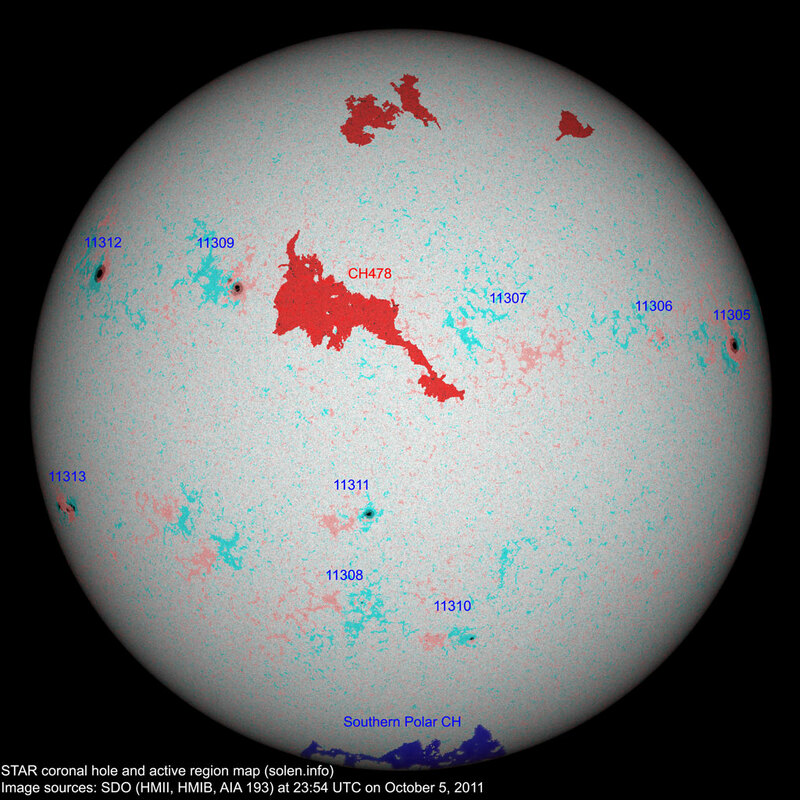 The geomagnetic field is expected to be quiet to active on October 6 due to CME effects and quiet to unsettled on October 7-8. Quiet to active is possible on October 9 due to effects from CH478.